Of the 32 football teams that make up the NFL, 14 have animals as their nicknames. But tomorrow, for only the third time in history, two teams with animals monikers will go head to head in the Super Bowl -- the Seattle Seahawks and Denver Broncos. The rarity of this matchup offers a nice opportunity to learn about the creatures themselves, how they came to be attached to the teams, and ultimately, what these names might say about us -- lest we forget that they were animals first. Let's start with Broncos. This term originally referred to a feral horse, untrained and unpredictable -- likely to kick and buck anyone who might try to control it as it roamed about the wild. Nowadays, bronco is more likely to be used as a term for domestic animals bred specifically to buck riders off in rodeos. "He wrote that broncos were tough and typified the West," she told the Colorado Spring Gazette. For his contribution, Vining was given season tickets. Likewise, when it came time for Seattle to select a name for its football team in 1975, a contest was held. The club received 20,365 entries pitching 1,741 different names -- of those, 150 fans suggested Seahawks. Seahawks is another term for ospreys, a common fish-eating bird-of-prey found throughout the world, not just Washington state -- but the alliteration alone may have been too pleasing to pass up. "Our new name shows aggressiveness, reflects our soaring Northwest heritage, and belongs to no other major league team," Seattle Seahawks' General Manager John Thompson said at the time. When it comes to sport team naming, selecting a moniker from the Animal Kingdom seems only natural -- particularly when the animal of choice connotes some sense of power, aggression, or cunning that football team would like to be associated with. Unlike with the other NFL team names, most of which refer to people (e.g., 49ers, Browns, Bills), players on animal-named team are imagined as personifications something non-human. But, interestingly enough, by taking the names Seahawks and Broncos, these two teams have come to largely overshadow awareness of their namesake animals. In their book Sport, Animals, and Society, James Gillett and Michelle Gilbert contend that the branding of these team names is less about paying homage to wildlife and more about co-opting animals for human purposes -- part of a long history of colonization, first of habitats and now of identities. "Ultimately, these team names, logos, and mascots not only constitute signifiers of commercial capitalism in postindustrial society but also serve to naturalize colonizing claims of ownership and dominion of land and animals... constituted as the nature that can be owned and controlled[.]" While that analysis might be a bit overreaching, one needn't look too far to see animals being controlled in a literal sense -- even within these two NFL franchises themselves. Both the Seattle Seahawks and Denver Broncos employ living, breathing mascots, paraded in front of screaming crowds at the opening of every home game. Since 2005, an Augur hawk (not an osprey) called Taima has been forced to fly through the tunnel leading onto the field ahead of the Seahawks' player and endure contact from the excited crowds. In Denver, a purebred Arabian gelding (not a bronco) serves as the team's living mascot, dressed in the team colors and made to prance across the field during opening ceremonies at the Bronco stadium. 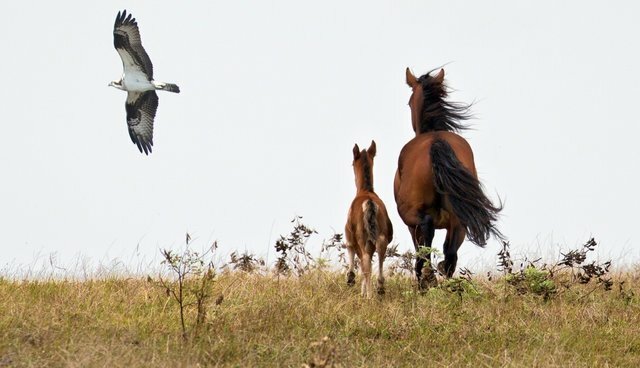 Leading up to and during the Super Bowl, one of the biggest cultural events of the year, the names Seahawks and Broncos will no doubt be mentioned thousands of times on airways around the globe -- but we'd be remiss to forget that a bird and a equine wore them first.